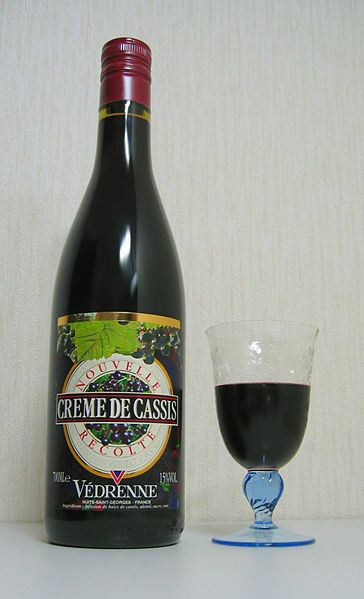 Crème de cassis is a blood-red, sweet, blackcurrant flavored liqueur, and is an ingredient of kir, an apéritif. The modern version of the drink first appeared in the Burgundy region in 1841, displacing "ratafia de cassis" from prior centuries. It is made from blackcurrants crushed into refined alcohol, with sugar subsequently added. While crème de cassis is a specialty of Burgundy, it is made in other cities of France, as well as in Luxembourg and Quebec. The quality of crème de cassis depends on the variety of fruit used as well as content of the berries and the fabrication process. Several cocktails are made with crème de cassis, including Kir. It is a favourite drink of the fictional detective Hercule Poirot by Agatha Christie.